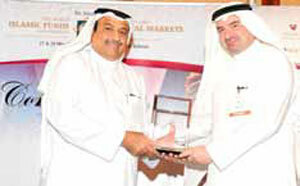 Sedco Capital, the Jeddah based asset management company, was voted as the 2013 WIFFMC Islamic Investment Institution of the Year from a short-list of nominees through an industry-based voting process. The achievements, innovations and excellence in the global Islamic funds and investments industry were recognised yesterday at the WIFFMC 2013 awards ceremony at the Gulf Hotel. The award recognises a leading institution that has demonstrated outstanding achievements and institutional excellence in major performance areas, reported the Gulf Daily News, our sister publication. Central Bank of Bahrain (CBB) executive director for financial institutions supervision Abdul Rahman Al Baker presented the award to Sedco Capital's chief executive Hasan Al Jabri. "We are extremely delighted to have been voted the WIFFMC Islamic Investment Company of the Year and we would like to thank the Bahrain government for their continuous support over the past three decades for the Islamic finance industry," Al Jabri said. "Receiving such a prestigious award is a testament of our ability to provide sustainable long-term asset growth and steady income to our clients with a unique and customised service that exceeds expectations. "This award is recognition of the commitment and dedication of our people and is a reflection of the success of our processes, products and guiding principles. "Over the years, Sedco Capital has become a partner of choice for institutional and high net worth investors with whom we share our best-in-class expertise and access to prime investment opportunities globally. "Sedco has launched, sponsored and co-sponsored a diverse range of Sharia-compliant funds and each of these funds has been structured to provide consistent returns above industry benchmarks," he said. "We would also like to thank the organisers of the WIFFMC 2013 for their professional approach in bringing the industry practitioners together in such a prestigious forum," he added. Sedco Capital said the award highlights the company's successful track record of managing assets worth more than $3 billion for clients across a wide and globally diversified range of investment opportunities in private equity, real estate and public equity delivering superior returns in all asset classes for more than one-and-half decades.